In this issue of Mallard 75 : Britons beamed with pride after LNER A4 streamlined Pacific No. 4468 Mallard reached 126mph on July 3, 1938, setting a world steam speed record that has never been broken. Yet how do you celebrate the 75th anniversary of what was the zenith of not only a great decade in which glamorous express trains competed to see which could travel from London to Scotland in the fastest time, but also the steam age itself? The answer: reunite Mallard with all five of its surviving sister locomotives for a spectacular series of three events at the National Railway Museum in York and its Locomotion branch in Shildon. One problem: two of them have, for the past half century, been exhibits in North American museums, institutions which had stoutly refused to let them return across the Atlantic… until now. 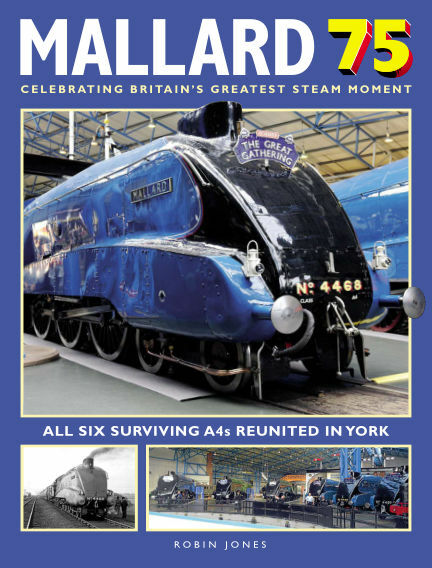 This special publication tells the story not only of LNER chief mechanical engineer Sir Nigel Gresley’s Pacifics and Mallard’s international headline-grabbing feat, but also that of the five other A4s still with us – including the ‘Mission Impossible’ repatriation of Dwight D Eisenhower and Dominion of Canada and their cosmetic restoration in their ‘home’ country – to make the ‘Great Gathering’, one of the biggest and most successful events in the history of railway preservation, a dream come true. With Readly you can read Mallard 75 (issue Issue 01) and thousands of other magazines on your tablet and smartphone. Get access to all with just one subscription. New releases and back issues – all included.